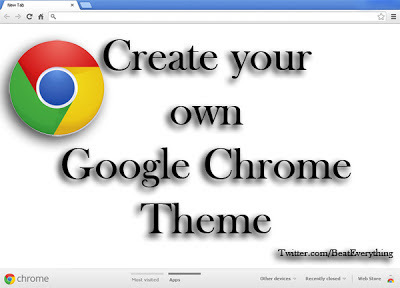 So here is guide how you can make your own themes for Chrome. 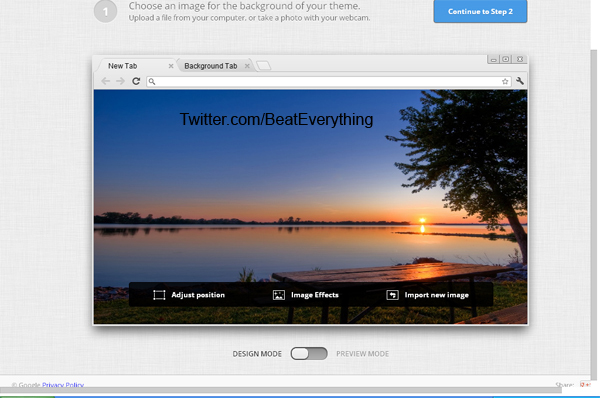 You don’t need special skills because there is a plug-in that can make theme for you with only few clicks. You just have to upload your image and select colors that you want. What to do for creating theme? 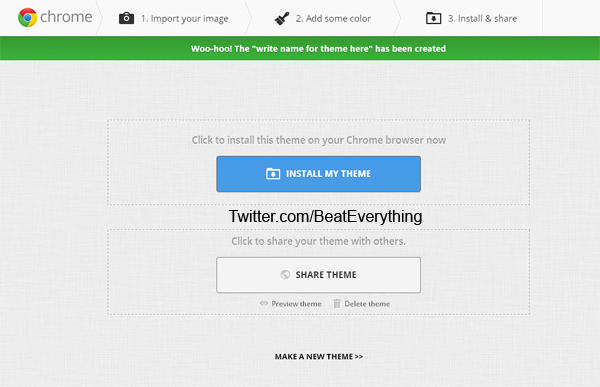 First of all download and install a free extension in Google Chrome named as My Chrome Theme. You’ll need to login to your Google account to download and install this extension. After successful installation you’ll see its icon in Apps tab (open new tab in chrome and click on Apps at bottom). 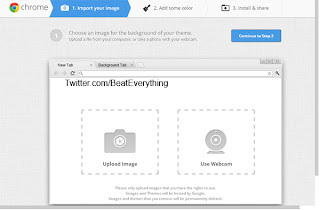 Click on icon of My Chrome Theme to get started. After clicking on its icon you'll see page as shown above. 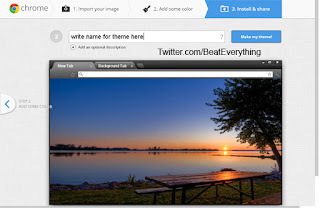 Click on start making theme. You’ll see a page with options for selecting your image (this works offline). 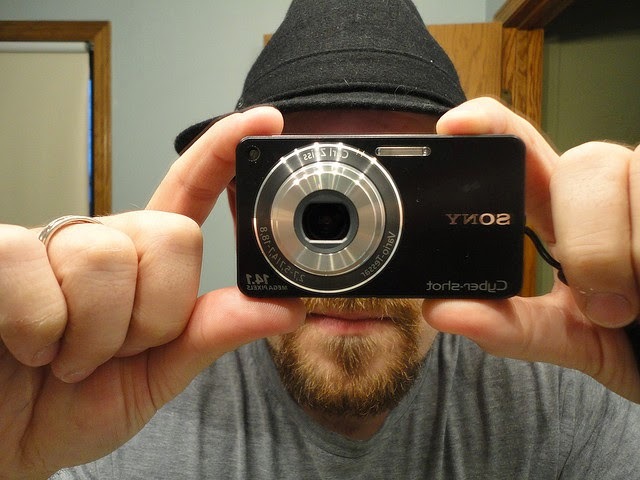 You can select image from your hard drive or you can use your webcam to capture your own picture. After selecting image you’ll see your image as chrome’s background with three options in a frame like Chrome. Click on adjust image position to move image right or left etc or you can add some effect to your image. If you don’t like your image then use another image by clicking on third option. After configuring everything here click on continue to step 2. On step 2 click on blue colored brushes to change color of respective region or you can click on I am feeling lucky to get colors automatically. After adjusting colors click on continue to step 3. 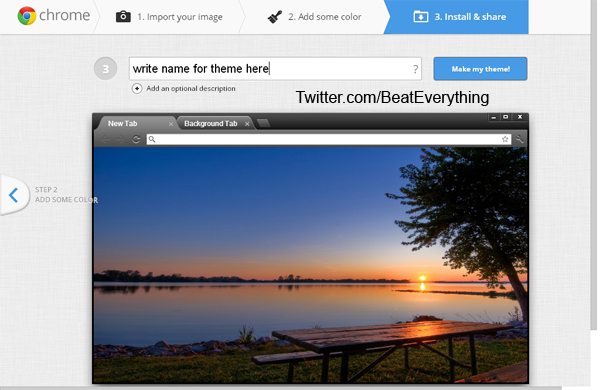 This step will show you preview of your theme and you can give name and description to your theme from given boxes. If you don’t like something or want to change/edit something then you can click on back arrow on left side of screen to move to previous steps. But if everything seems good then give name to your theme. Description is optional but if you want you can describe your theme. After naming your theme and giving it little description click on Make my theme. 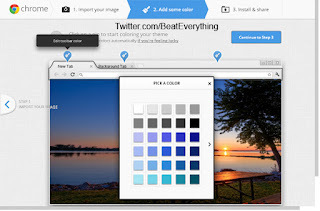 You’ll see a new page with different options from where you can install your created theme to your Google Chrome or you can share your theme with your friends. 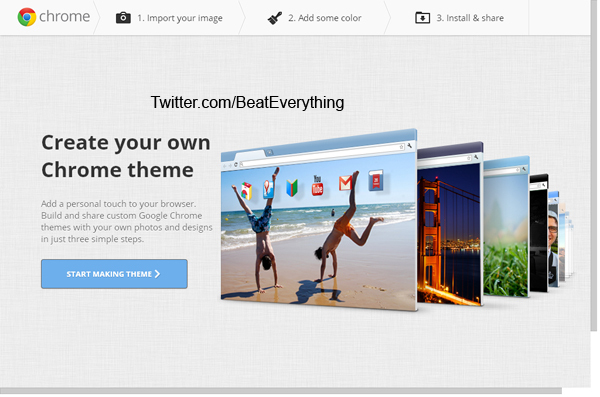 I hope this helped in making theme for chrome with no special skills.